I just ordered a set of the newest Peghed design. They look great in the photos Chuck Herin sent. The new peg has a tapered string post so it looks like they can be set without worrying over the ' minding the gap' that would occur on the old pegs where they poke out if the headstock. The new peg is slightly longer too, and due to the taper on the string post there is some adjustment space for different thickness headstocks. It looks good. I should get them next week. I'll follow up with more review, but I think he nailed it this time. IMHO they are to thick and look clumsy. Besides you need (yet) another reamer and this one is quite expensive. Interesting to know if they work better than the 8mm ramirez where I never had any problems with the fitting and which is thinner and therefor in my eyes more elegant. I mean, the reason to use mechanical peges is to have a guitar that looks like an old guitar with wooden pegs and I dont find they do that. You just need to get a 1:25 reamer. I'll post a photo of the new one later today. The one on the left is the new design. On the right the order design. It's a little longer and the string post doesn't have the old rim that had to match the level of the headstock. The peg just sticks out like a wood peg. There's also a cheap work around for the reamer. I'll show you a picture of how I made it. looks good! how much does a set cost? could you post a link? For builders he gives a little discount. Hey nothing is cheap any more except wood pegs. I laid in a stock of wood pegs to season for use for the remains if my career. It cost less than two sets of Pegeds. However I treat Peghed tuners as a well made product that is on par with say the Rubner tuners I like. Anders, I have a reamer work around for the 1:25 reamer if you Don't want to buy another. I just moved a few months ago and still an sorting through stuff in my new shop. I'll locate the scraping reamer tomorrow. Thanks Stephen, but I've more or less taken the decission to stop using pegheds. 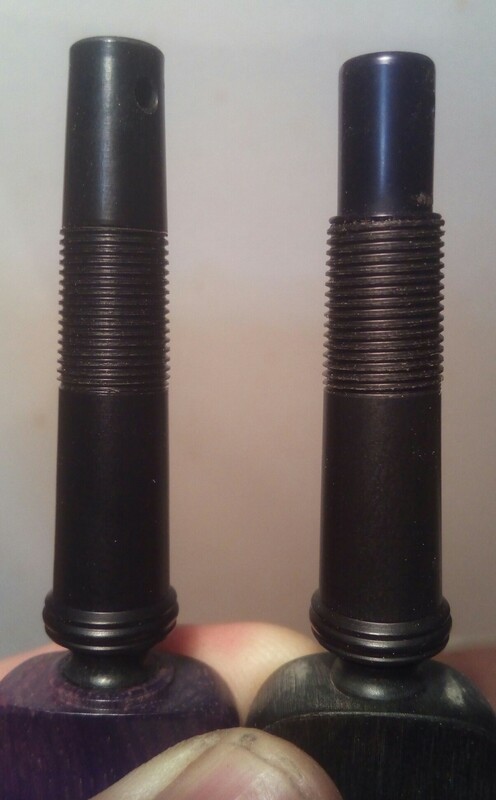 On the photo, the old one to the right is the old 9mm peghed? For some reason the URL keeps sucking my inquiry into it multiple times without stopping. What am I doing wrong? Then I have to shut the computer down to get rid of it. hey stephen, wow, thats a lot more i thought it would cost! i think i go for wooden pegs then. There's nothing wrong with Herin's website. Hit your system update drop menu, select System Update, down load the latest updates, restart your computer. Your computer probably hasn't been updated since 1993. The pegheds website is little more than a landing page. Call him. He ins S. Carolina. The 945E is more expensive than the older ones. They were $165.00 per set, about 25 US dollars per peg. The 945E are about 30 dollars per peg. The first Pegheds came on the scene 2004 slightly earlier - Nearly 15 years ago. He $165 per set didn't seem excessive then and I value forwarded the price onto the total cost of a guitar. I like Rubner tuners and other sets of tuners in the $200.00 range for most flamenco guitars I make. The Pegheds are in the price point, and the added $40.00 since 2004/2005 seems reasonable to me. He also has a good repair policy: He'll repair any peg fpr free as long as it is not damaged on the outside shaft, and he can replace grips too. When it is all said and done the "Pegheds" are the best choice for me. They provide faster tuning, much faster string changes, and they look nice and less cluttered on a flamenco guitar. I have had 5-6 guitars with them and no issues. I'm setting up the action on a Peghed installation guitar now. It's so much better than roller tuners. I hate taking the tension down and up while I check saddles and nuts etc. With Pegheds it takes 30 seconds to bring the strings back to checking tension. So much easier. Pegheds allow you to leave the guitar on the bench and reach behind the head, roller tuners require practically picking up the guitar and tuning it. Even with string winders it's a longer process. I'm in the middle as I like the mechanical pegs 1:4 ratio vs. traditional wooden or modern mechanicals. I think "classical" tuners with high ratios while incredibly smooth at times 1:14 and 1:18 takes so long. Hey experts...neophyte peg question for you. If I have a guitar with traditional wood pegs and I want to replace them with Pegheds, is it a simple replacement or do the peg holes need to be redone? Thanks! You can, but the holes need to be reamed a bit larger. Not much. It's not a job I'd recommend for a non professional guitar maker. It's much more difficult than changing gear and roller tuners. Maybe its about time that you take a look into your tecnique when it comes to working with machine heads. I have none of the problems you mention and can easily tune up and down the guitar without taking it away from the bench. But maybe you are to biased on this pegheds trip of yours. Pegheds are cool enough and work very well, but they are just fat mechanical pegs. Nothing else. Just a fact of mechanical engineering. That's all I'm saying. You have some special obi wan Kenobi Jedi tuner trick we non Jedi can't do? We turn tuner grips the same way.